Today I rang in the New Year a little early; I went back to the bench for the first time since having back surgery 6 weeks ago. I am being careful, listening to my body, and working in short shifts with plenty of down time in between sessions but I am working again! 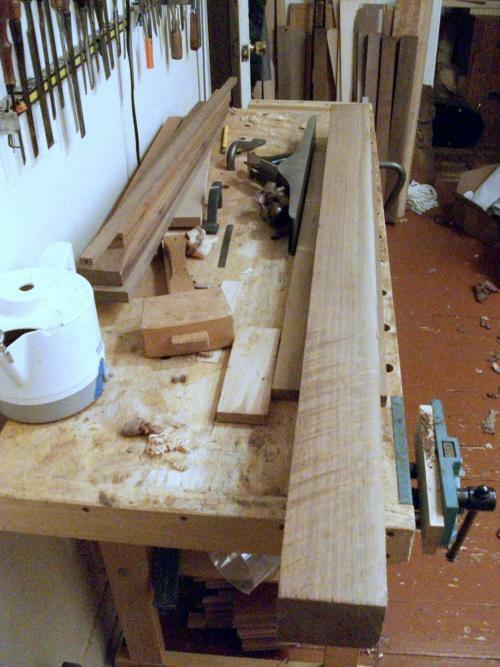 The bench shot shows some wood that will become several walnut dulcimers. I have some orders for walnut dulcimers and have had a few more inquiries about dulcimers in walnut. Is some famous celebrity playing a walnut dulcimer? I had already bent the sides in the photograph but they needed a little touch-up on the hot-pipe to get them just right. The small crock-pot is my glue-pot. When I heated up the glue-pot I knew I was really getting back to work! I have a few other instruments in the queue and will take on the tasks to make them as I am able. By having to work slowly and in short installments I find myself focusing more on each small process. I can’t remember the last time I felt such joy in trimming a side to length with a dozuki and bench hook. For now it is a day at a time with no expectation of how often I can work or how much I will accomplish each time I enter the shop but life is rolling back towards normal. Well, what I consider normal. Your mileage may vary. Good news, Doug! Pretty exciting for you, I’m sure. Take it easy, but enjoy your time you are able to spend in the workshop. Life is good. Thanks! Had to take several days off to take it easy but hope to be in there for a bit tomorrow. I love my job! Glad to know you’re at the bench again where you belong. Sure is pretty walnut– enjoy making as many wood shavings as you feel able to do so. Take care, Doug. The value of life does not depend upon the place we occupy. It depends upon the way we occupy that place.